MORE alleged Uber cleaning fee scam victims are coming forward with their stories in an effort to warn other users of the popular app. On May 7, Brisbane couple Alexandra Montoya and Colin Conroy used the ride sharing service to travel from their home to Treasury Casino - a short journey they had taken many times before - when they noticed their driver was taking the wrong route. After pointing out the driver's mistake, Mr Conroy claimed he became "aggressive" - and so the couple asked to be let out of the Toyota Camry before reaching their destination, at around 4pm following an eight-minute drive. Ms Montoya, who was upset by the driver's behaviour, left a one-star review and explained it was because she believed he had deliberately taken a longer route in an effort to charge more, and because of his rudeness. But a few days later, Ms Montoya discovered $150 had been deducted from her bank account by Uber as a "cleaning fee". 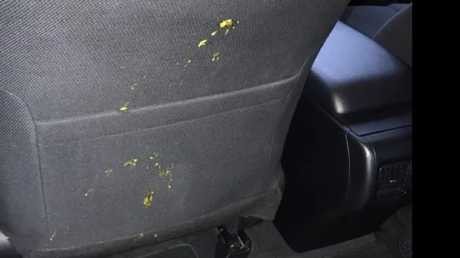 After contacting the company to demand answers, Ms Montoya was sent photos of the mess she and Mr Conroy were accused of making, which shows a yellow liquid on what appears to be a car door, seat and floor. Mr Conroy told news.com.au he was convinced the driver had staged the mess as an act of "revenge" following their disagreement. "Uber has totally sided with the driver, but the pictures look like someone staged the whole thing," he said. "Who would make a mess like that at 4pm? I absolutely think it was revenge-related. "We're definitely not using Uber again and we won't stop until this is resolved. My advice [to other customers] is to take photos or videos in the car as proof next time." Mr Conroy said he had researched Toyota Camrys online, and believes the car pictured in the photographs was an entirely different make and model. He said the couple had contacted Ms Montoya's bank to try and recover the fee, and were told by a staff member that they had received many similar complaints from other Uber customers. Mr Conroy also said the photos the couple were given did not have a date stamp, meaning they could have been taken at any point. Ms Montoya said she believed the couple had fallen victim to the common "fake vomit" Uber scam, and insisted they had not dirtied the car in any way. "This is not just about money, it's about moral principles - the driver is cheating," she said. 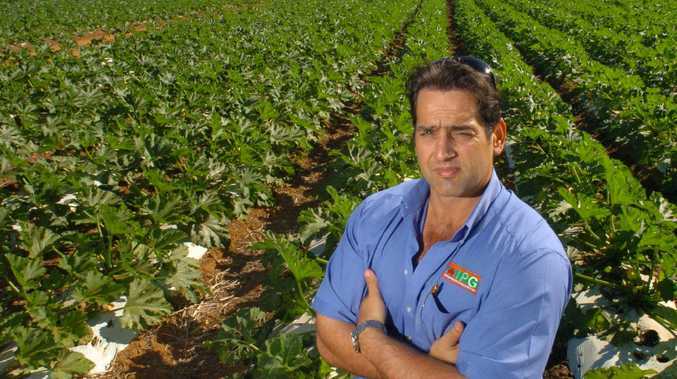 "We are very honest and hardworking people and we are outraged that someone stole [from] us and used this service which we trusted, to swindle. "We continue to send emails to Uber support, but they insist that they will not refund our money." The couple also visited an Uber Greenlight Hub, a site which offers in-person support to customers, but a resolution was not reached. 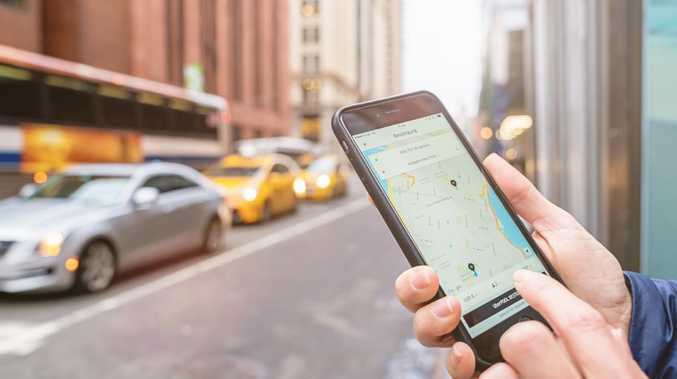 Earlier this year, news.com.au spoke to a former Uber driver who made explosive claims about a "widespread scam" being carried out by other drivers across the country. He said drivers were brazenly trading tips and boasting about the profits they were making from various rip-offs on Uberpeople.net, an online forum especially for Uber drivers, with the cleaning fee for fake messes one of the most common cons. "The cleaning fee is an easy one because all you need is a tin of soup and some cling film (so that you don't actually ruin your car)," the man explained. News.com.au has also reported on a number of similar cases involving the cleaning fee scam, and we have been inundated with emails from alleged victims, including Nikki, who was charged $150 after using the app in Sydney in April. 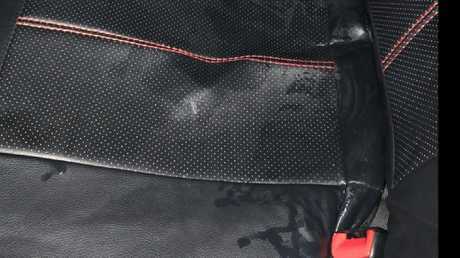 Like Mr Conroy and Ms Montoya, Nikki, 23, was given photos as "proof" which showed the back seat of a car with what appears to be a small amount of clear liquid. The driver claimed the liquid was urine, but Nikki insisted it was just water, as it had been raining heavily as she waited for the driver. 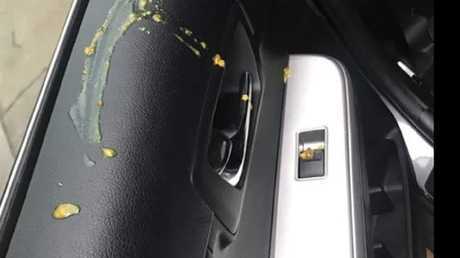 Nikki was charged $150 after her driver claimed she left urine in the back seat. "I am a young, 23-year-old woman who was travelling alone and I believe the Uber driver decided to take advantage of my situation by wrongfully charging me a cleaning fee," she said. News.com.au contacted Uber for comment, but a response was not received before deadline.